Eid Mubarak to All Readers of Sufi News And Sufism World Report: Have a Blessed Eid ul-Fitr! Picture: Eid U.S. postage stamp, September 1, 2001. Design/Calligraphy by Mohamed Zakariya. 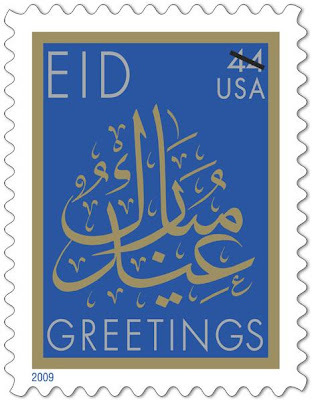 Wiki/Eid Mubarak: On September 1, 2001, the United States Postal Service (USPS) released a 34 cent Eid postage stamp. When the first-class postal rate increased in 2002, 2006, 2007, 2008, and 2009, this stamp was re-issued with the new rates.